Morgan Wootten compiled a remarkable 1,274-192 (.869) record in his unparalleled 46-year coaching career at DeMatha High School. With five national championships, 44 consecutive seasons with at least 20 wins, and a number one ranking in the Washington, DC, area in 20 of his last 33 years as coach, Wootten retired in 2002 as the winningest--and one of the most respected--coaches ever. Each option starts with a team’s on-court alignment and basic movements against no opponent. Next comes an animated version of the play in dynamic, graphical form. Then the play is performed again, this time live and at full speed against an opponent to show exactly how to execute it in a game situation. Throughout the instruction, Wootten provides teaching points and drills to master the execution of each tactic. Wootten remains a popular clinician throughout the world. 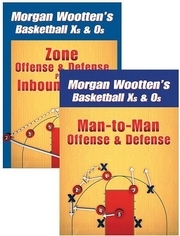 Morgan Wootten’s Basketball Xs and Os is like having his clinics on DVD, showing the precision with which DeMatha practiced and drilled their offenses and defenses to become a perennial national powerhouse. Morgan Wootten first put DeMatha on the national map of high school basketball in 1965 when his team broke the 71-game winning streak of Lew Alcindor's Power Memorial (New York) club. He went on to compile a remarkable 1,274-192 (.869) record in his 46-year career at DeMatha High School in Hyattsville, Maryland. Under Wootten, DeMatha won legendary national championships in 1962, 1965, 1968, 1978, and 1984. In 1984, USA Today named Wootten the National Coach of the Year. He was inducted into the Naismith National Basketball Hall of Fame in 2000. Regarded as one of the best teachers in the history of the game, Wootten has sent more than 160 high school players on to play college basketball, and a dozen have played in the NBA. More than 20 of his former assistant coaches or players are now coaching on the high school, collegiate, or professional level. Coaches throughout the world have sought Wootten's wisdom in his book Coaching Basketball Successfully, watched his videotapes, and sat spellbound through his clinics for many years. Wootten retired from coaching in November 2002. He resides in Hyattsville, Maryland.